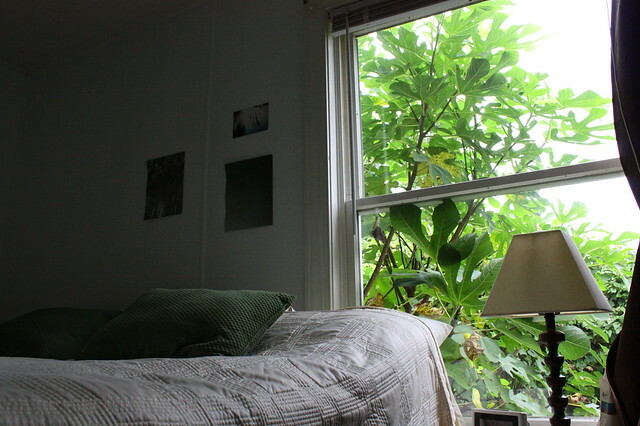 Our bedroom; encroaching fig tree. But back to Mom: She has a great eye, which she passed along to Grace. I wouldn’t say that Kelsey and I are devoid of this eye, but we certainly don’t have its abundant powers, which are so clearly manifested in our mother and youngest sister. I aspire to this spiritual gift of the beautiful home, and so I study people like my mom and my sister, and people like Catherine, Stephanie, Ross, Matt and Liz, and Cate, who also have this gift. I want to know how they know what they know. How they can walk into stores that look crammed with junk and find this perfectly patina’d treasure. How they know what works and what doesn’t. How they show such control and restraint. Can I have a beautiful home if I don’t have the great eye or the gift? I don’t know, but I do see this ability — to make a beautiful home — as a spiritual gift. A peaceful, welcoming, lovely house shows fruit of the spirit. It’s not everyone’s gift and nor should it be; but I maintain that it is a gift and that it can work on souls with as much power as prophecy. I read a few books on feng shui during my interior design-reading craze. Although I had trouble believing in many of its essential principles or suggestions (e.g., “Sprinkle sea salt on the floor where you sense negative energy”), the majority of the feng shui wisdom applied to interiors made so much sense to me, even as a western person. It makes sense that high ceilings make the spirit feel freer and lighter and that low ceilings make one feel trapped. It makes sense that mirrors open spaces and that the direction of windows can significantly affect one’s chi. I am fascinated by these tenets, because I have felt the truth of them in many spaces. If buildings can act as a repository of our ideals, it is because they can be purged of all the infelicities that corrode ordinary lives. A great work of architecture will speak to us of a degree of serenity, strength, poise and grace to which we, both as creators and audiences, typically cannot do justice–and it will for this very reason beguile and move us. Architecture excites our respect to the extent that it surpasses us. Buildings work and act on our hearts, whether we want them to or not. And this is why I believe in the spiritual gift of beautiful housekeeping and homemaking. We are beguiled and moved by the physical spaces we inhabit. Now I just have to figure out how to attain this gift myself. Starting with finding a house with higher ceilings. As of Tuesday, I have read 100 books this year, a sizable portion of which were how-to books about keeping houseplants alive. My fiction numbers are down considerably from last year, a fact which I still blame on David Foster Wallace. Headed off this weekend to see my brother Win get hitched to my soon-to-be sister Tracy! Can’t wait.